The receding tide washes out to sea leaving behind a treasure trove of modern motorcycle sculpture and pirates gold. Against the warm glow of a tropical sky a custom chopper gleams in the sand and is discovered by tourists and treasure hunters alike. This dazzling example of the latest radical custom is shown in stunning detail as it sparkles on the beach. Produced for the “Hogs on The High Seas” cruise by Royal Caribbean Cruise Lines, “Hidden Treasures” adds a new twist to the title. Incorporated cleverly into various aspects of the painting are secondary images, names and other nuances that will amaze and fascinate the viewer. 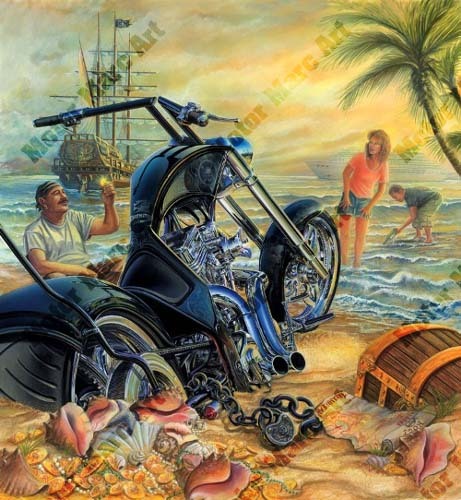 Among the effects hidden in the features of the bike are a beach scene, a pirate guarding his treasure and many more obscure clues. Can you find them all? As always Motor Marc is concealed in the painting in trademark style. The palm trees and conch shells combine to create a Caribbean flair and complete the theme.